This was a [very long] singing event featuring several minor idols. I went to see Itou Asuka. I arrived around 19:30, and the third or fourth performer was on the stage. There were around 25 people in the crowd, with the front two rows sitting and others standing. 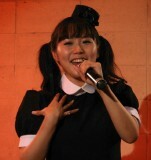 Asuka's stage started at around 20:50, and she sang four songs. Asuka was wearing a black one piece with white trim (a black maid outfit without the apron), black over the knee socks, and black shoes. She also had a small black hat. Asuka's stage lasted for around 20 minutes, and her songs were as follows. Suzuki Marie was the last performer, and her stage was very good, as usual. At the end of the event, there was a raffle for signed presents by all of the performers. After the event, all of the performers sold some goods. Asuka sold a set of 5 photos for 500 yen. I used my 20D and 24-105mm F4L IS, and took 670 photos (ISO1600), with 205 of them worth keeping. Usually photos aren't allowed at Asagaya Drum, but Asuka said that she would allow photos. So photos were allowed only during Asuka's stage. But Asagaya Drum is VERY dark, so the photos weren't very good.